Written by Tianna DuPont, WSU Extension Specialist; Mark Mazzola, USDA-ARS; Howard Ferris, Department of Entomology and Nematology, University of California Davis. November 2017. A diversity of microscopic round worms called nematodes inhabit orchard soils. Many of the nematodes in orchards contribute to soil health functions. Fungal feeding, bacterial feeding, predatory and omnivorous nematodes provide a number of services including nitrogen mineralization and plant pathogen suppression. However, plant-parasitic nematodes feed on plants; damaging roots, creating wounds which may serve as infection points for plant pathogenic fungi, and directly transmitting certain pathogens, such as viruses, to the host plant. Plant-parasitic nematodes have a needle-like stylet in their mouthparts which they use to feed on plant cells. Nematodes can either be migratory or sedentary. Migratory nematodes move through roots as they feed, disrupting plant cells or feed entirely on the outer surface; sedentary nematodes manipulate normal cell development and create a feeding site. All of these lifestyles and behaviors interrupt the plant’s ability to transport water and nutrients. Nematode feeding can also directly kill plant cells, root hairs and even whole roots. However, plant-parasitic nematodes feed on plants; damaging roots, creating wounds which may serve as infection points for plant pathogenic fungi, and directly transmitting certain pathogens, such as viruses, to the host plant. Plant-parasitic nematodes have a needle-like stylet in their mouthparts which they use to feed on plant cells. Nematodes can either be migratory or sedentary. Migratory nematodes move through roots as they feed, disrupting plant cells or feed entirely on the outer surface; sedentary nematodes manipulate normal cell development and create a feeding site. All of these lifestyles and behaviors interrupt the plant’s ability to transport water and nutrients. Nematode feeding can also directly kill plant cells, root hairs and even whole roots. Here we will describe a few key plant-parasitic nematodes that can cause damage in the orchard. Figure 1. Lesion nematode. Photo credit: Howard Ferris, UC Davis. Lifecycle and damage: Lesion nematode is considered a migratory endo- and ectoparasite. This means that it can be found living and reproducing in the soil and feeding both on the outside and the inside the root. Feeding of the nematode kills root cells and when the nematodes move through the root they damage and disrupt root tissue inhibiting water and nutrient movement into the plant. Feeding damage also provides access channels for fungi, bacteria and other organisms. Life cycles vary from 45 to 65 days (Smiley 2010). Symptoms: Young trees, especially apples, infected with lesion nematodes exhibit poor growth. Yields of infected trees may be significantly lower than non-infected trees. Infected roots generally have discolored and necrotic (black) areas where nematode feeding has caused cell death and where additional pathogens have likely invaded. Severely affected root systems may lack feeder roots. However, these symptoms may be difficult to distinguish from those caused by other pathogens on tree roots. Thresholds: Lesion nematode thresholds for Washington orchards are not well established. However, based on experience in other states, pre-establishment action thresholds per soil sample of 500 cc (approx. 1 pint) are A: 0-10 crop should not be affected; B: 20-70 may cause crop damage; C: 80+ will likely cause damage. Dagger nematode is an economic concern in orchards because it can vector viruses including tomato ringspot virus (TRSV), the cause of apple union necrosis and decline, the Cherry rasp leaf virus (CRLV) which causes flat apple, and Peach rosette mosaic virus (PRMV). Lifecycle and damage: Dagger nematode is a migratory ectoparasite which means it attacks roots from the outside. It is a relatively large nematode (1.3 to 2.2 mm) (Akinbade et al. 2014). 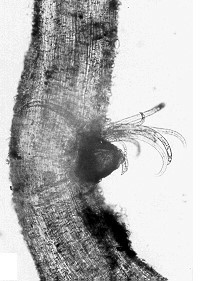 Dagger nematode has a long, hollow, needle-like stylet called an odontostyle which it uses to feed on cells at root tips. Feeding can cause root tip cells to enlarge, disrupting function and resulting in roots that have a knobby stunted appearance, with swellings at the tips. While its life cycle has not been experimentally confirmed, researchers suggest that it may be up to one year in duration with individuals living 3 to 5 years. Dagger nematode can harbor virus particles in the esophageal lumen near the stylet extension and in the glandular region of the esophagus. As the nematode feeds virus particles can be transmitted to the plant within 24 hours of exposure (Ferris 2016). Since the stylet, the stylet extension and the lining of the esophageal lumen are shed when the nematode molts, virus particles are lost as the nematode passes from one life stage to another. 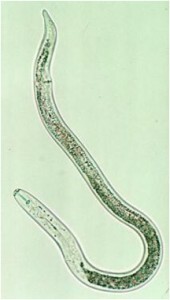 However, changes in life stage occur when the nematode is at a feeding site and taking in food. Consequently, virus particles are rapidly reacquired from the plant on which the nematode is feeding. Symptoms: Above-ground symptoms of nematode damage can be hard to detect and easily confused with other plant stresses resulting from water or nutrient deficiencies. The most commonly recognized symptoms that can be attributed to this pest are those that result from transmission of the associated viruses. Plant symptoms resulting from viral infection commonly include: chlorotic mottling and defoliation; bright yellow discoloration of foliage; yellowing along main leaf veins; spots, blotches and crinkling of leaves; and stunting. See Orchard Viruses. As with most nematodes the presence and abundance may be most readily determined by soil sampling. Threshold: Nematode damage thresholds in Washington are not well established. However, based on experience in other states pre-establishment management thresholds per 500 cc soil sample (approx. 1 pint) are: A: 0 no crop damage, B:1-10 may cause crop damage, C: 20+ likely to damage. The threshold is so low (1) due to the potential to vector viruses. Ring nematode is common to soft fruit orchard soils and in concert with the bacterial canker pathogen, Pseudomonas syringae and freeze damage. It has been associated with the phenomenon termed peach tree short life(Cao et al. 2006, Ritchie and Clayton 1981). Root feeding in Pome and Stone fruit can result in loss of up to 85% of small roots causing significant water and nutrient stress (Westerdahl and Duncan 2015). As higher populations of Mesocriconema are known to occur in sandy soils with large pore spaces, this nematode deserves greater scrutiny when examining nematode populations in coarse-textured Washington orchard soils. However, it is not currently known to be an economic concern in Washington. Lifecycle and damage: Ring nematodes feed on roots from the outside with a long spear-like stylet. They feed primarily on fine roots killing them, and stunting growth of lateral roots. Symptoms: Trees may show water and nutrient stress due to small, damaged root systems. Trees with no noticeable vigor issues directly from nematode feeding may develop bacterial canker particularly under conditions where cold damage has been experienced. Threshold: Ring nematode damage thresholds in Washington are not established. 1 Listed as Criconemella and Criconematodes in earlier literature. Figure 2. Paratylenchus neoamblycephalus feeding. Photo credit: Lownsbery, 1975. Pin nematode is a minor pest in orchards. Lifecycle and damage: Pin nematode is a small nematode which feeds singly or in groups on the outside of plant roots. Feeding causes small lesions and death of lateral roots. In general, it is found randomly distributed in the orchard across tree rows and alleyways (Howland, Schreiner, and Zasada 2014). Symptoms: Small root lesions may be noticeable. General plant decline may be difficult to diagnose. Threshold: Damage thresholds for pin nematode are not established for orchards. Figure 3. 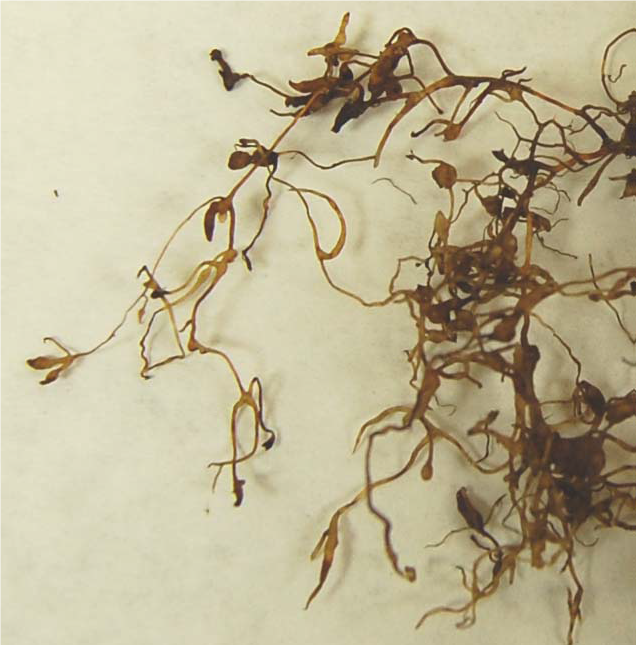 Root-knot nematode galls (strawberry roots). Photo credit: M Mazzola, USDA-ARS. Most root-knot nematode species have a wide host range affecting tree fruit as well as most small fruits, vegetables, and grains. Known for the gall formation it induces on plant roots, root-knot nematode can cause plant nutrient and water stress by disrupting plant root function. Lifecycle and damage: Root-knot nematode is a sedentary endoparasite. This means that while juveniles live in the soil outside the roots, adult females live and feed inside host roots. The second stage juvenile invades the root and establishes the feeding site. When root-knot nematodes insert their needle-like stylet into plant cells they inject proteins that make the cells grow abnormally. Instead of growing and dividing, the cells create additional nuclei and become larger. This ‘giant-cell’ produces copious proteins which the nematodes then ingest. Abnormal root development inhibits root function, resulting in a diminished capacity of roots to efficiently uptake water and nutrients (Mitkowski 2003). Adult root-knot nematodes are generally concentrated in the irrigated root zone in vineyards (Howland, Schreiner, and Zasada 2014), and are likely to be concentrated in the irrigated root zone in Washington orchards. Most root-knot nematode species have a very wide host range. Symptoms: Root-knot nematode feeding can cause large galls on infected plant roots. Plants may show signs of water stress or nutrient deficiency due to compromised root systems. Threshold: Root-knot nematode damage thresholds are not established for orchards. In order to determine nematode numbers in the orchard, sample soil in the root zone, either at the tree dripline, the edge of the weed strip, or near drip emitter lines. At least 15 cores per five-acre block should be taken to a depth of at least 10 to 12 inches. In orchards with full size (non-dwarfing) trees, a second sample from 12-24 inches is advisable. Plant feeding nematodes are in the highest concentration in the root zone. Mix the 15 or more subsamples in a clean bucket and remove a sample of one pint and place it in a plastic bag to send to a nematode testing lab. Remember nematodes are living and so soil samples should be kept cool (do not freeze) during sampling and shipping. To determine the trajectory of nematode damage it is useful to sample twice a year (Ferris et al. 2004). Nematode sampling can be done at any time of year that the ground is not frozen. However, fall sampling may be more appropriate since nematode densities will be highest at this time of the season. The distribution of lesion nematode, and the associated potential for replant disease can be missed with standard soil sample assessment (above) due to the percentage of nematodes inside plant roots (as well as other factors). Mist chamber extraction from root tissue is a more predictable assay. The Oregon State University Nematode Clinic website will give information on how to send a root sample. Plant bioassays also more predictably assess potential damage to new plantings from lesion nematode. Currently, this method is not offered commercially. In brief, a soil sample made up of subsamples from at least fifteen areas in a plot is divided in two where half is pasteurized (80-100 C for 8-12 hours) and apple seedlings grown in pasteurized and unpasteurized soil. Growth is then compared between apple seedlings in pasteurized and unpasteurized soil. New field preparation: It is critical to rip and cultivate soil in order to remove plant roots harboring nematodes, to reduce plant stress to the next planting, and to enhance the efficacy of any fumigation or nematicide applications that may be used. Green manures and fallow: Most plant-parasitic nematodes that are problematic in orchards have a wide host range. Leaving a field fallow may reduce nematode numbers. However, because weeds and other crops such as alfalfa are also hosts, reduction in nematode populations may not be sufficient to reduce crop damage unless a poor host is planted. Consider a green fallow with a poor host (see table 1 below). For dagger nematode, planting orchard ground to a non-host for the virus (such as a grass) can be effective in reducing the concentration or distribution of the virus. Dagger nematodes which feed on the grass cover crop will lose the virus particles present their esophageal area and thus will not be able to transfer the virus to fruit trees in later feeding events. Cultivars of any plant species may differ in their susceptibility to species of nematodes. Similarly, populations of a nematode species may differ in their virulence to plant species or cultivars. Additional research and/or monitoring may be necessary to determine the suitability of cover crops for management of local nematode populations. We provide a table of the host status of some cover crop cultivars to populations of nematode species that are considered important in orchards. Table 1. Cover crop host susceptibility. Rootstock selection: Tree architecture and productivity considerations often override nematode concerns in rootstock selection in Washington. Some rootstocks have known tolerance to nematodes. Table 2. Nematode resistance in Prunus rootstocks. S=Susceptible, R=Resistance, MS=Medium Susceptible, MR=Medium Resistance. From Nemabase, updated Ferris 2017. Includes rootstocks grown in Washington. For a complete table visit Nemabase or contact authors. Myrothecium verrucaria (DiTera® DF2) is a fungus. Limited greenhouse trials have shown efficacy (Dong et al. 2015). Most commercial products utilize the metabolites produced by the fungus during the fermentation process in combination with heat killed mycelium of the fungus. The material may be directly nematicidal, may inhibit nematode egg development and can reduce the nematodes ability to find the host (Wilson and Jackson 2013). Paecilomyces lilacinus (MeloCon WG2) is a fungus which can parasitize nematodes. When spores of this fungus come in contact with nematodes, spores germinate and fungal hyphae directly parasitize eggs, juveniles and adult nematodes by excreting chitinase and direct penetration with appressoria. In greenhouse trials, P. lilacinus reduced nematodes 30% (Hashem and Abo-Elyousr 2011) and 67% in a field trial (Saha and Khan 2016). The treatment is generally applied in a suspension of water through ground application or drip irrigation. Care must be taken to follow storage requirements of this living product. Natural enemies. Plant-parasitic nematodes are food resources for many other organisms, including certain fungi, predaceous and omnivorous nematodes, tardigrades, some collembolan, and others. Unfortunately, many natural enemies are not tolerant of conventional tillage, cultural, and fertilizer practices common in orchards and vineyards. In particular, many natural enemies are more abundant and active in soils with higher levels of organic carbon. That is because they either use the organic residues as a resource or increase in abundance because they feed on other organisms that utilize the resources. Soil organic matter levels and the natural enemies of nematodes that are supported may be elevated by the use of cover crops or by supplementing organic matter from external sources. Management with organic matter additions requires a consistent program, not just a one-time application. You are attempting to nurture the soil organisms and their interactions. With the use of cover crops, it is important to select species that do not support the plant-parasitic nematode species that you are trying to manage. Examples of some of the principles and ideas that underlie such approaches are provided in Ferris et al. (2012) and Ferris and Tuomisoto (2015). 2 products with an OMRI label. K-Pam HL (metam-potassium) is registered for sprinkler application on orchard replant sites in Washington. Luna Privilege (fluopyram) is registered for chemigation in stone fruit and pome fruit orchards in Washington. A mixture of 1,3-dichloropropene (1,3-D) and chloropicrin (CP): Telone C35 (61% 1,3-dichloropropene and 35% chloropicrin) is one of the most widely used pre-plant fumigants. It provides acceptable control of nematodes and soil borne pathogens. Virtually impermeable films (VIF) and totally impermeable films (TIF) improve retention of fumigant volatiles in the soil resulting in improved efficacy and reduced chemical emissions (Cabrera et al. 2015, Gao et al. 2016). Note. Chemical nematicides and fumigants may have harmful effects on the organisms of the soil food web that contribute to biological regulation of pest nematode species. Akinbade, S. A., H. Mojtahedi, L. Guerra, K. Eastwell, D. E. V. Villamor, Z. A. Handoo, and A. M. Skantar. 2014. First Report of Xiphinema rivesi (Nematoda, Longidoridae) in Washington State. Plant Disease no. 98 (7). Cabrera, J. A., B. D. Hanson, J. S. Gerik, S. Gao, R. J. Qin, and D. Wang. 2015. Pre-plant soil fumigation with reduced rates under low permeability films for nursery production, orchard and vineyard replanting. Crop Protection no. 75:34-39. doi: 10.1016/j.cropro.2015.05.003. Cao, T., M. V. McKenry, R. A. Duncan, T. M. DeJong, B. C. Kirkpatrick, and K. A. Shackel. 2006. Influence of ring nematode infestation and calcium, nitrogen, and indoleacetic acid applications on peach susceptibility to Pseudomonas syringae pv. syringae. Phytopathology no. 96 (6):608-615. doi: 10.1094/phyto-96-0608. Dauphinais, N., G. Belair, Y. Fournier, and O. P. Dangi. 2005. Effect of crop rotation with grain pearl millet on Pratylenchus penetrans and subsequent potato yields in Quebec. Phytoprotection no. 86 (3):195-199. Dong, H. L., X. G. Zhou, J. M. Wang, Y. M. Xu, and P. Lu. 2015. Myrothecium verrucaria strain X-16, a novel parasitic fungus to Meloidogyne hapla. Biological Control no. 83:7-12. doi: 10.1016/j.biocontrol.2014.12.016. Ferris. 2017. Xiphinema americanum, 11/29/2016 2016 [cited February 26 2017]. Ferris, H., M.V McKenry, B.A. Jaffee, C.E. Anderson, and A. Juurma. 2004. Population characteristics and dosage trajectory analysis for Mesocriconema xenoplax in California Prunus orchards. Journal of Nematology no. 36:505-516. Ferris, H., P.E. Pocasangre, E. Serrano, J. Monoz, S. Garcia, G. Martinez, and G. Martinez. 2012. Diversity and complexity complement apparent competition: nematode assemblages in banana plantartions. Acta Oecologica no. 40:11-18. Ferris, H., and H. Tuomisoto. 2015. Unearthing the role of biological diversity in soil health. Soil Biology and Biogeochemistry no. 85:101-109. Gao, S. D., L. M. Sosnoskie, J. A. Cabrera, R. J. Qin, B. D. Hanson, J. S. Gerik, D. Wang, G. T. Browne, and J. E. Thomas. 2016. Fumigation efficacy and emission reduction using low-permeability film in orchard soil fumigation. Pest Management Science no. 72 (2):306-314. doi: 10.1002/ps.3993. Hashem, Mohamed, and Kamal A. Abo-Elyousr. 2011. Management of the root-knot nematode Meloidogyne incognita on tomato with combinations of different biocontrol organisms. Crop Protection no. 30 (3):285-292. doi: http://dx.doi.org/10.1016/j.cropro.2010.12.009. Howland, A. D., R. P. Schreiner, and I. A. Zasada. 2014. Spatial distribution of plant-parasitic nematodes in semi-arid Vitis vinifera vineyards in Washington. Journal of Nematology no. 46 (4):321-330. Mitkowski, N.A. and G.S. Abawi. 2003. Root-knot nematodes. The Plant Health Instructor. DOI:10.1094/PHI-I-2003-0917-01 Revised 2011. Mojtahedi, H., G. S. Santo, and R. E. Ingham. 1993. Suppression of Meloidogyne chitiwoodi with sudangrass cultivars as green manure. Journal of Nematology no. 25 (2):303-311. Nyczepir, A. P., and P. F. Bertrand. 1990. Host suitability of selected small grain and field crops to Criconemella xenoplax. Plant Disease no. 74 (9):698-701. doi: 10.1094/pd-74-0698. Ritchie, D. F., and C. N. Clayton. 1981. Peach-tree short life – A complex of interacting factors. Plant Disease no. 65 (6):462-469. Saha, T., and M. R. Khan. 2016. Evaluation of bioformulations for management of root knot nematode (Meloidogyne incognita) infecting tuberose. Pakistan Journal of Zoology no. 48 (3):651-656. Smiley, R. 2010. Root-lesion nematodes: Biology and management in Pacific Northwest wheat cropping systems. PNW no. 617. Westerdahl, B. B. 2015. UC iPM: UC Management Guidelines for Nematodes on Apple. Available online http://ipm.ucanr.edu/PMG/r4200111.html. Westerdahl, B. B., and R. A. Duncan. 2017. Nematodes 2015 [cited March 12 2017]. Wilson, M. J., and T. A. Jackson. 2013. Progress in the commercialization of bionematicides. Biocontrol no. 58 (6):715-722. doi: 10.1007/s10526-013-9511-5.